So it’s early January and I’m in the middle of our new theatre show, Waa & the Seven Sisters. 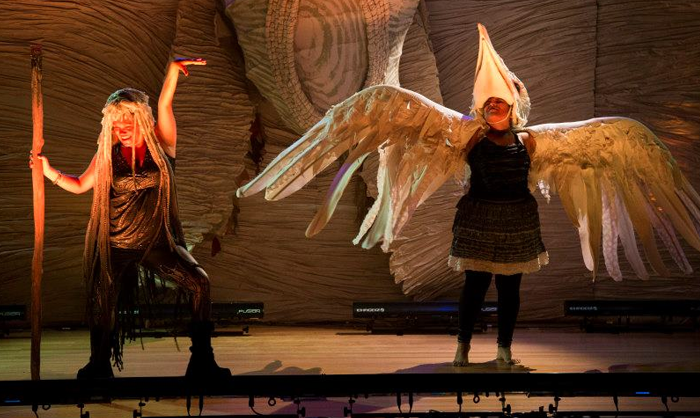 The show is the follow-up to last year’s Tiddalik the Giant Frog, and much like Tiddalik the show is based on a traditional Koorie creation story. This time around the story comes from the Kulin people of what is now known as Melbourne (and outlying districts and cities). I wrote the script for the show based on the way the story was told to me by Uncle Larry Walsh. The script also had input from our show’s director, Michael Camilleri, who really has been a fantastic force for bringing the show to life. What was once my vision has happily been handed over to Michael, and given his own distinct approach, along with that of the other crew working on the show. It’s great to work with such professional artists. Speaking of which, enough cannot be said when it comes to the abilities of our performers, Nikki Ashby and Uraine Mastrosavas. Both performers have been fantastic in the show, and it’s a pleasure to watch how they not only act out their roles, but also interact with the audience, injecting their energies into the show. If I do another show next year I can only hope to again work with such amazing people. « What I’ve been up to recently..